1 f Macromolecules such as proteins, polysaccharides, and nucleic acids are simply too large and too charged or polar to pass through membranes. This is a fortunate property. Think of the consequences if these molecules could diffuse out of cells: A red blood cell would not retain its hemoglobin! On the other hand, cells must sometimes take up or secrete intact large molecules. As we saw in Chapter 4, this can be done by means of vesicles that either pinch off from the plasma membrane and enter the cell (endocytosis) or fuse with the plasma membrane and release their contents (exocytosis). 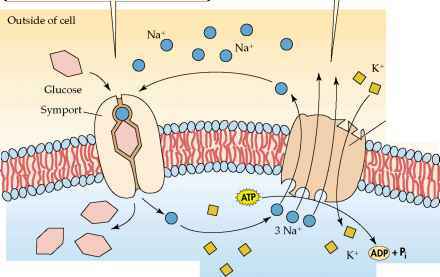 5.13 Primary Active Transport: The Sodium-Potassium Pump In active transport, energy is used to move a solute against its concentration gradient. Even though the Na+ concentration is higher outside the cell and the K+ concentration is higher inside the cell,for each molecule of ATP used, two K+ are pumped into the cell and three Na+ are pumped out of the cell. Sodium ions, moving with the concentration gradient established by the sodium-potassium pump, drive transport of glucose against its concentration gradient. 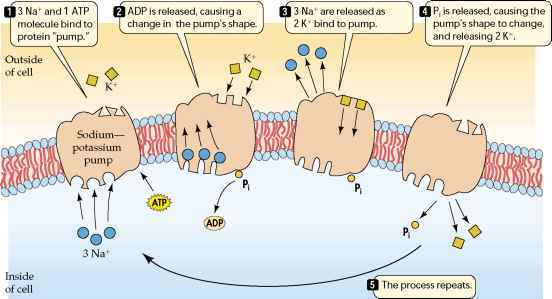 The sodium-potassium pump moves sodium ions, using the energy of ATP hydrolysis to establish a concentration gradient of Na+. Endocytosis is a general term for a group of processes that bring macromolecules, large particles, small molecules, and even small cells into the eukaryotic cell (Figure 5.15a). There are three types of endocytosis: phagocytosis, pinocytosis, and receptor-mediated endocytosis. In all three, the plasma membrane invaginates (folds inward) around materials from the environment, forming a small pocket. The pocket deepens, forming a vesicle. This vesicle separates from the plasma membrane and migrates with its contents to the cell's interior. In phagocytosis ("cellular eating"), part of the plasma membrane engulfs large particles or even entire cells. Phagocytosis is used as a cellular feeding process by unicellular protists and by some white blood cells that defend the body by engulfing foreign cells and substances. The food vacuole or phagosome that forms usually fuses with a lysosome, where its contents are digested (see Figure 4.13). In pinocytosis ("cellular drinking"), vesicles also form. However, these vesicles are smaller, and the process operates to bring small dissolved substances or fluids into the cell. Like phagocytosis, pinocytosis is relatively nonspecific as to what it brings into the cell. For example, pinocytosis goes on constantly in the endothelium, the single layer of cells that separates a tiny blood capillary from its surrounding tissue, allowing the cells to rapidly acquire fluids from the blood. 5.14 Secondary Active Transport The Na+concentration gradient established by primary active transport (right) powers the secondary active transport of glucose (left). The movement of glucose across the membrane against its concentration gradient is coupled by a symport protein to the movement of Na+ into the cell. In receptor-mediated endocytosis, specific reactions at the cell surface trigger the uptake of specific materials. Let's take a closer look at this process. Receptor-mediated endocytosis is used by animal cells to capture specific macromole-cules from the cell's environment. This process depends on receptor proteins, integral membrane proteins that can bind to a specific molecule in the cell's environment. The uptake process is similar to nonspecific en-docytosis, as already described. However, in receptor-mediated endocytosis, receptor proteins at particular sites on the extracellular surface of the plasma membrane bind to specific substances. These sites are called coated pits because they form a slight depression in the plasma membrane. The cytoplasmic surface of a coated pit is coated by proteins, such as clathrin. The plasma membrane surrounds a part of the exterior environment and buds off as a vesicle. 5.15 Endocytosis and Exocytosis Endocytosis and exocytosis are used by all eukaryotic cells to take up substances from and release substances to the outside environment. ened and stabilized by clathrin molecules, this vesicle carries the macromolecule into the cell (Figure 5.16). Once inside, the vesicle loses its clathrin coat and may fuse with a lysosome, where the engulfed material is processed and released into the cytoplasm. Because of its specificity for particular macro-molecules, receptor-mediated endocytosis is a rapid and efficient method of taking up what may be minor constituents of the cell's environment. 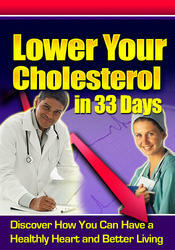 Receptor-mediated endocytosis is the method by which cholesterol is taken up by most mammalian cells. 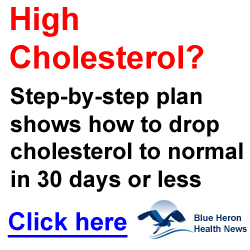 Water-insoluble cholesterol and triglycerides are packaged by liver cells into lipoprotein particles, which are then secreted into the bloodstream to provide body tissues with lipids. One type of these particles, called low-density lipoproteins, or LDLs, must be taken up by the liver for recycling. This uptake also occurs via receptor-mediated endocytosis. This process begins with the binding of LDLs to specific receptor proteins on the cell surface. Once engulfed by endocytosis, the LDL particle is freed from the receptors. 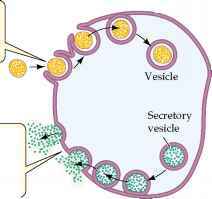 The receptors segregate to a region of the vesicle that buds off to form a new vesicle, which is recycled to the plasma membrane. The freed LDL particle remains in the original vesicle, which fuses with a lysosome in which the LDL is digested and the cholesterol made available for cell use. Persons with the inherited disease familial hypercholesterolemia (-emia, "blood") have dangerously high levels of cholesterol in their blood because of a deficient receptor for LDL. tial event in this process is the binding of a membrane protein protruding from the cytoplasmic side of the vesicle with a membrane protein on the cytoplasmic side of the target site on the plasma membrane. The phospholipid regions of the two membranes merge, and an opening to the outside of the cell develops. The contents of the vesicle are released to the environment, and the vesicle membrane is smoothly incorporated into the plasma membrane. In Chapter 4, we encountered exocytosis as the last step in the processing of material engulfed by phagocytosis: the secretion of indigestible materials to the environment. Exocy-tosis is also important in the secretion of many different substances, including digestive enzymes from the pancreas, neurotransmitters from nerve cells, and materials for the construction of the plant cell wall. What is pocket formed by an inward folding of membrain? What process is used by cell to secrete material outside the plasma membrane? What process is used by the cell to screte material outside the plasma membrane? How do endocytosis and exocytosis plasma? What process always moves materials from outside the cell to inside the cell? What are the steps of exocytosis? What invaginates the plasma membrane? Does pinocytosis depend on a conc gradient?